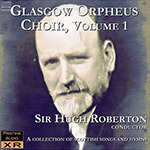 "The Glasgow Orpheus Choir was founded in 1901 and was disbanded in 1951. It started in a Working Men's Club, and over the fifty years of its life I held office as its Conductor. Indeed, I have been described as its "onlie begetter". Certainly it grew up around me, and it came to occupy a position so unique that when, through advancing years, I had to announce my resignation, the members unanimously decided to call it a day. There was at once a great public outcry. But the Choir, as a body, stood firm, supported as they were by practically all those who knew the Choir best and loved it most. Their view was, as our President put it - "the Orpheus is H.S.R. and H.S.R. is the Orpheus". For, in the words of another member, "we are allowing the Choir to die in order that it may live". What was the secret of the choir's great hold on the public? What was its appeal? To find an answer to those questions would be as vain as to try to strain the blue from the sky. That it had a hold on the public is undeniable. And not simply the Glasgow public. Wherever it went the Orpheus was welcomed and acclaimed. And it went far, giving regular concerts in England and Ireland as well as at home. And it might well have gone further (and done more) but for the fact that its work was trisected and interrupted by major and devastating wars. As it was, its itinerary (in the years of its being) embraced six European countries as well as the U.S.A. and Canada. Not a bad record. The whole point of the Orpheus was that it reached the heart of the people everywhere, and this, probably because it always sang from the heart as well as the mind. (The Orpheus was a real choir of real people, people big enough to dedicate themselves selflessly to a noble purpose, and it never took its audiences cheaply, nor did it ever descend to tricks or exhibitionism.)" This is the first of two volumes taken from three ten-inch HMV LP issues of the early 1950's, sent to me in near-mint condition for restoration by Nicolas Hawtrey. They were replayed using a Benz Micro moving coil cartridge, custom-tipped by Expert Stylus Ltd. with their exclusive Paraglide stylus, the result of many years work and research into the ultimate diamond shape and size for the reproduction of mono vinyl. I used two distinct and very different solo choir recordings to create a broad reference for re-equalisation of the LPs, which in their original incarnations required a certain degree of fine-tuning.